The first line of each haiku or senryu is taken from “Time as Memory as Story” by Simon J. Ortiz. of stray light, she dwells. Posted on November 25, 2012, in Blue Monday, haiku, Postcards from Paradise, senryu, The Poetry Pantry, The Sunday Whirl. Bookmark the permalink. 28 Comments. really loved number 1 and 5 in particular…well done as always. Loved each one…like children, not one better than the rest. I think poets (and readers) have their favorite poems too. I’m often surprised when people are delighted by one of my poems that I think is only so-so. The last one is pure magic. love especially the “Fifty years ago” and the “to say what time is” pieces… thank you. You are ever so versatile !!! man, this is great! especially the last section…and the two before that.so basically the last three sets.wonderful sensitive imagery.brilliant. Man, this is great! Esp the last three sets.beautiful sensitive imagery.brilliant! Each one is a moment in time. The pauses between them to savor. Again, I like each one for its own peculiar qualities. The thirsty ponies and the willows as women stand out for me this week, although I love them all. Your work fills me. I, too, dwell in what might be the scent of iris or a fleck of stray light and it is a good place to be. Lovely verses, every one. I always enjoy the depth of meaning in your haiku. I enjoy them more than most haiku, and I really like haiku. I love the three thirsty ponies. And the willows in the wind. Journeys, ponies and one’s fall from grace– brilliant! MMT, a lovely collection, but the second is my absolute favourite. How unique…I wish I’d thought of this way of dealing with the wordle. “The first line of each haiku or senryu is taken from “Time as Memory as Story” by Simon J. Ortiz.” I am not familiar with this but you have made it memorable by your haiku or senryu. A thoroughly enjoyable write. Thank you. I love them all but the last one is my favorite. Great words we can all learn from. hello mmt, poems 4,5 and 6 really touched me esp 5. Wonderful. I’m particularly fond of the potato finale. I like the fourth one. Even in something so short I get a clear picture of the woman. Each one is a jewel as if beads on a prized necklace want to outshine the others. Grace is something we need to honor ourselves with more. Grace is like love in want of a clear definition – each person has their own favorite out of a multitude of options. May we all be able to be wild, free and joyful at some point. Thank you. “To say what time is” stanza is magical. I love it. i love them all. Thanks for visiting. 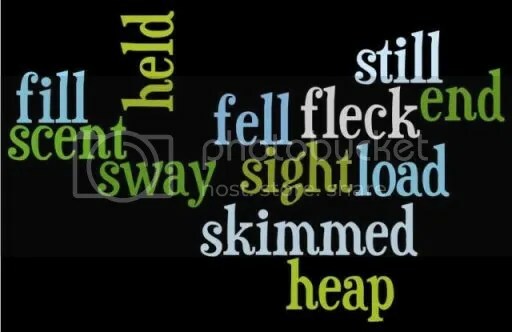 What a delightful (again, as always) integration and connection of your shenryu/haiku for this Wordle Challenge! Thank you for visiting mine and leaving such a nice comment as well! Come back!